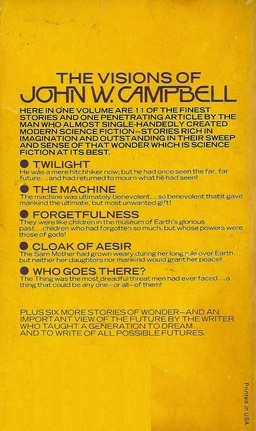 John W. Campbell is one of the most important figures in 20th Century science fiction and fantasy. If Campbell’s name seems familiar, it’s no accident. He’s come up multiple times in this series so far. In my last article, The Best of Hal Clement, I noted that Clement’s heroes frequently quoted Campbell’s pulp heroes Morey and Wade, and that Clement had been discovered by Campbell in June 1942, when Campbell was editing Astounding Science-Fiction. In my previous piece, on The Best of Jack Williamson, I also observed that Williamson had “survived the coming of Campbell,” by which I meant that he was one of the few authors talented enough to continue writing SF in the pulps after about 1939, when Campbell had re-made the entire field in his image. I could go back through all the other articles in this series and see just how often Campbell comes up, but I think you get the point. In the first half of the 20th Century, science fiction existed almost solely in the magazines and Campbell dominated the field so thoroughly that the start of the “Golden Age of Science Fiction” is usually marked by the year he began editing Astounding — the year he discovered writers like Robert Heinlein, A.E. Van Vogt, Isaac Asimov, Theodore Sturgeon, Lester del Rey, and many others. But we’re not here to talk about Campbell the editor. We’re here to talk about Campbell the writer. And specifically, the eleven short stories he wrote between 1932 and 1939 collected in The Best of John W. Campbell. Campbell’s first published story, “When the Atoms Failed,” appeared in the January 1930 issue of Amazing Stories, edited by T. O’Conor Sloane. Campbell was only 19 years old at the time, a student at the Massachusetts Institute of Technology; by the time he was 21, he had sold half a dozen stories to Amazing. He’d also flunked German and left MIT; he eventually graduated from Duke University with a Bachelor of Science in physics in 1932. 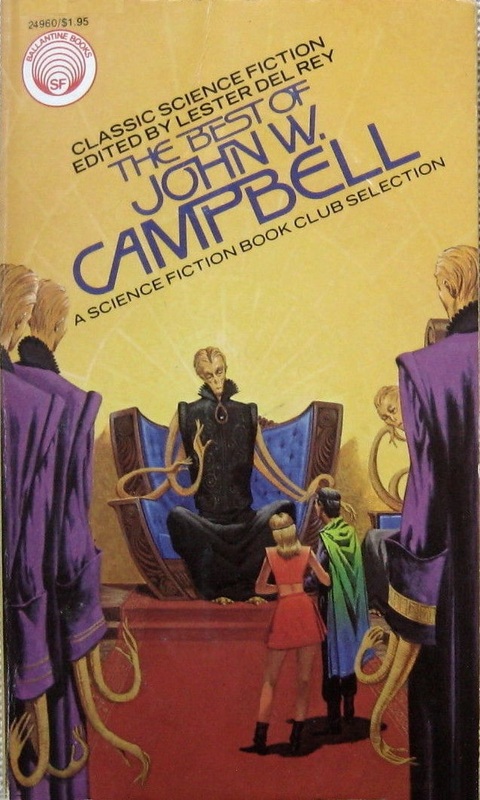 Campbell’s early stories were super-science space opera, of the type pioneered by E.E. “Doc” Smith in the pages of Amazing Stories in the 1920s, and the young Campbell proved to be very proficient in the genre. Three of his earliest stories for Amazing featured the intrepid twenty-second-century space explorers Arcot the physicist, Morey the mathematician, and Wade the chemist. There wasn’t a sinister alien armada or cosmic riddle that could stand up to the combined resourcefulness of his three heroes, and the stories proved popular. 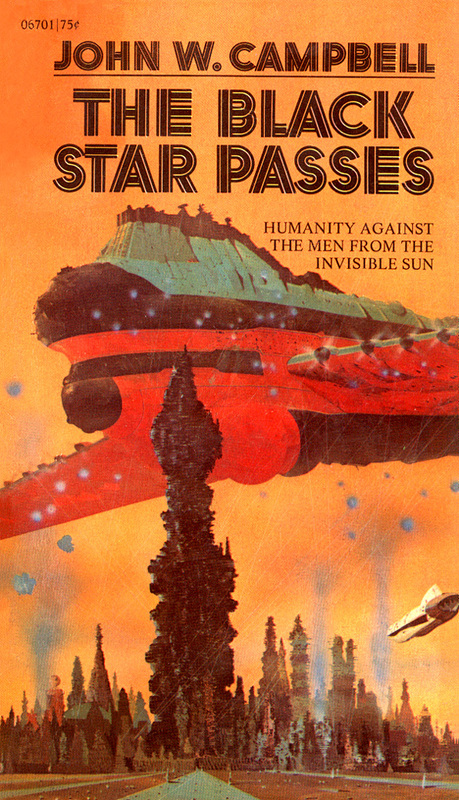 Campbell’s first novel featuring the three, The Black Star Passes, appeared in the Fall 1930 issue of Amazing Stories Quarterly. Many more were to follow, including Islands of Space, the cover story of the Spring 1931 Amazing Stories Quarterly, and Invaders from the Infinite, in Amazing Stories Quarterly Spring-Summer 1932. Ace Books reprinted all three novels in paperback in the late 60s, where they fired the imagination of an entirely new generation. 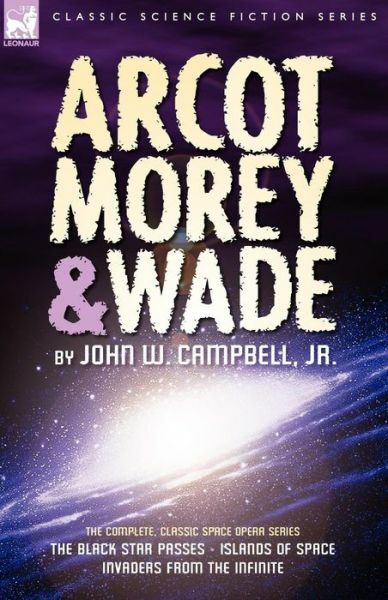 Eventually, all three were collected in the handsome and affordable omnibus edition Arcot, Morey & Wade: The Complete, Classic Space Opera Series (cover here), which included The Black Star Passes, Islands of Space, and Invaders from the Infinite. It was published by Leonaur in June, 2008 and — lucky you — is still in print. Campbell branched out beyond the Morey and Wade stories in later years and broke out of the pages of Amazing at the same time. In 1934–35, he published a serial novel in the pages of F. Orlin Tremaine’s Astounding Stories, The Mightiest Machine (reprinted in paperback by Ace in 1965). I first encountered Campbell in Asimov’s anthology, Before the Golden Age, with his 1936 tale “The Brain Stealers of Mars.” Sort of a precursor to “Who Goes There?” the story follows the explorers Penton & Blake, who risk the Atomic Power Research Death Penalty to develop an atomic drive and immediately use it to outrun the authorities and light out to Mars — where they discover a race of telepathic shape-changing aliens who promptly mimic the two of them, by the dozens. They can’t return to Earth until they sort out who’s who… but exactly how do you outwit a race of telepathic shape-changers? “The Brain Stealers of Mars” (let’s face it, one of the most awesome titles in the history of science fiction) originally appeared in the December 1936 issue of Mort Weisinger’s Thrilling Wonder Stories. It was eventually collected, with the other Penton & Blake stories, in The Planeteers, a 1966 Ace Double paired with his 1936 novel, The Ultimate Weapon. If that were all the fiction Campbell produced in the 1930s, his writing career would almost certainly be all but forgotten today. Fortunately for us, it was not. Campbell gradually tired of the space opera formula, but his name was irrevocably tied to it. Starting in 1934, he began to experiment with a very different and more mature type of story and he knew he needed a pseudonym to do it. Stealing his wife’s name (Dona Stuart), Campbell began a whole new career under the name Don A. Stuart. With his Stuart tales, Campbell threw off most of the expectations of pulp SF, including the fast action and super-science. In its place he substituted believable characters and more thoughtful themes. As the story opens, a real estate agent named Jim Bendell is speaking casually to an unnamed first-person narrator. The dialogue is friendly, contemporary. Then Bendell talks about a bizarre man he picked up on the road the previous day. The style shifts, the quotation marks vanish, and Bendell becomes the narrator. He converses with the strange man, who claims he is a time-traveler from a thousand years in the future who traveled seven million years forward, and when trying to get back to his own time overshot it and landed in 1934. It’s an incredible performance… especially for 1934. The same issue in which “Twilight” first appeared was also running the fourth installment of E. E. Smith’s The Skylark of Valeron, zip-pow super-science if there ever was one. I love E. E. Smith, no apologizes, but “Twilight” couldn’t have been more different from a Skylark adventure, and readers noticed it — and loved it. The Don A. Stuart stories were eventually collected in a marvelous book from NESFA Press: A New Dawn: The Complete Don A. Stuart stories (published 2003). 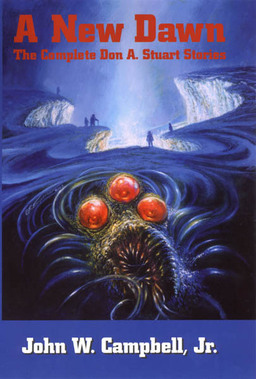 Campbell’s other Stuart stories include “The Machine,” “The Invaders,” “Frictional Losses,” “Cloak of Aesir,” and “The Elder Gods,” published in Unknown magazine, Astounding‘s sister magazine, also edited by Campbell. In Unknown, Campbell didn’t want to create yet another knockoff of Weird Tales; the tagline for the paper-covered anthology From Unknown Worlds was “Fantasy Stories for Grown Ups” – by which he seems to have meant the serious grownups who were reading Astounding. Lots of his Astounding writers crossed over to write for Unknown, and “The Elder Gods” was apparently his how-to-do-it example, applying the Astounding method of speculative fiction to fantasy. The two sets of gods can’t affect each other directly, but the Invisible Ones have a stranglehold over almost everyone on the islands of Azun. If the Elder Gods are to have a chance, they need someone who hasn’t been subordinated into the Invisible One’s religious system, someone whose actions they won’t be able to predict or control. So the gods shipwreck a passing sailor and toss him up onto the beaches of Azun. His mortal arm will be the Elder Gods’ weapon against their invisible enemies. But Stuart’s (and Campbell’s) most famous tale — indeed, one of the most famous science fiction stories ever written — was “Who Goes There?” from the August 1938 Astounding. A chilling and entirely effective tale of a team of Antarctic researchers who stumble on a crashed alien vessel and its frozen — but still very much alive — inhabitant, “Who Goes There” is as much a horror story as it is science fiction. Gone are the easy solutions of “The Brain Stealers of Mars” and in their place is a creeping paranoia and the terror of facing a truly alien lifeform. 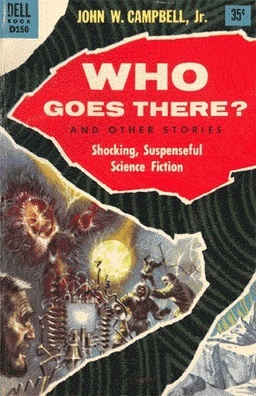 The novella “Who Goes There?” is one of the most reprinted stories in the history of science fiction. The Internet Speculative Fiction Database lists over 70 publications it has appeared in since 1938, including Adventures in Time and Space (1946), The Science Fiction Hall of Fame, Volume 2A (1973), The Mammoth Book of Short Science Fiction Novels (1986) and Who Goes There? and Other Stories, a 1955 Dell paperback with a Richard Powers cover (at left — click for a bigger version). “Who Goes There?” has been adapted to film no less than three times; first as The Thing from Another World in 1951 (read Ryan Harvey’s review here), then by John Carpenter in the classic The Thing (1982), and finally in the modern prequel, The Thing in 2011 (Ryan’s review here). It was published in Astounding roughly a year after Campbell became editor and it was nearly the last Don A. Stuart story. 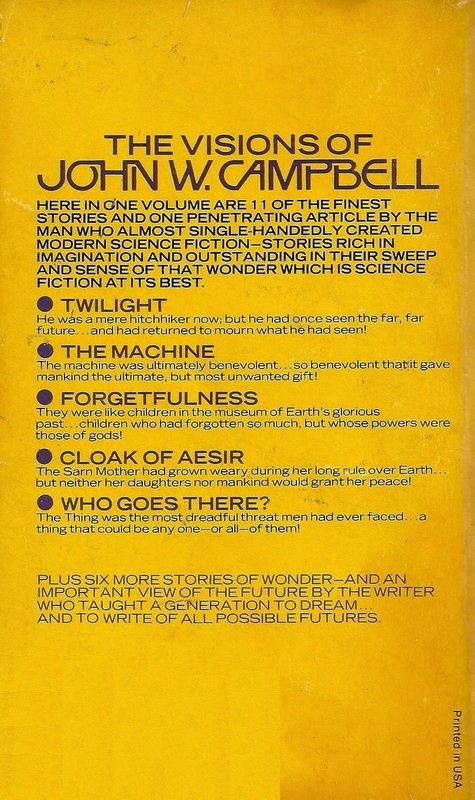 Shortly after it appeared, Street and Smith, the publisher of Astounding and Unknown, told Campbell buying his own fiction for the magazines was a conflict of interest and he had to stop. 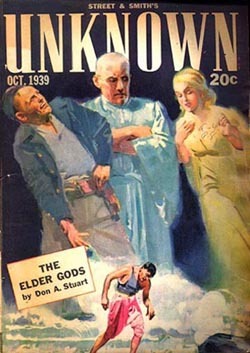 “The Elder Gods,” in the October 1939 Unknown, was the last Don A. Stuart story and it brought John W. Campbell’s career as a science fiction and fantasy writer to a premature close. If you’re interested in a more detailed looked at the early writing and editing career of John W. Campbell, I highly recommend the last issue of the legendary fanzine Fantasy Commentator, Spring 2011. The entire issue (164 pages!) is taken over with the correspondence between Campbell and his friend, R.D. Swisher. The letters cover 20 years, from before his time at Astounding until the mid-1950s, carefully edited and annotated by Sam Moskowitz before his death in 1997. This is as close as we’re likely to come to a John W. Campbell autobiography covering these years. Campbell’s comments and opinions on the field are fascinating, and he certainly doesn’t hold anything back. Fantasy Commentator Spring 2011 is available through Lulu for $9.60. You might think a collection of pulp stories from a writer in his early 20s might not be able to compete with some of the other volumes in The Best Of series, which generally draw from long careers. However, you would be mistaken. The Best of John W. Campbell is one of my favorite volumes in the series. It’s packed with short stories and novellas that still read well today. Although it draws heavily from the Don A. Stuart years, there’s also one of his early Amazing stories, “The Last Evolution,” from 1932. The cover on the paperback was by H.R. Van Donagen. The Science Fiction Book Club edition was published in May 1976, a month before the US paperback. 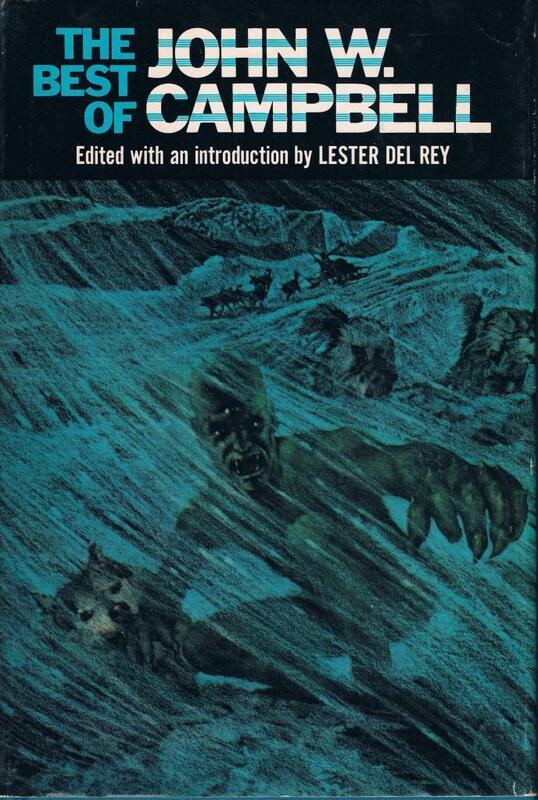 As usual, the SFBC edition had a different cover, inspired I think by the 1951 film The Thing from Another World, with a husky valiantly chewing on the alien’s arm (click for a bigger version). 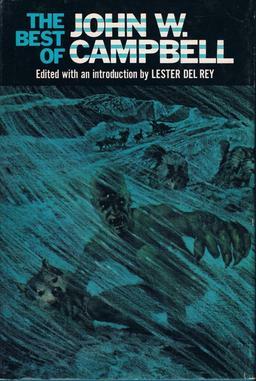 Lester Del Rey provided the intro, as he frequently did. Campbell died in 1971, five years before the book appeared, and his widow provided the Afterword. Campbell wrote an editorial for every issue of Astounding/Analog from 1938 to 1971; one of his better pieces, “Space for Industry,” from April 1960, is also included. 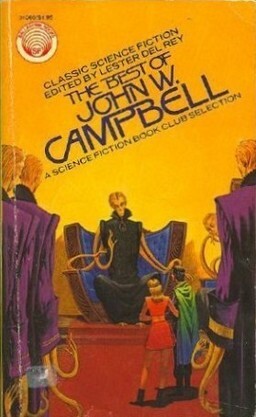 The Best of John W. Campbell was published by Ballantine Books in June 1976. It is 364 pages and was priced at $1.95. There is no digital edition. I’ve only read this book once, shortly after I joined the SFBC way back in, well, a long time ago. I’ve read a number of the stories again since then in other places. I’m thinking it’s about time I went back and reread some. Are you planning on continuing this series with Best Of’s from other publishers once you finish with the Del Reys? > I love the van Dongen cover. He captured the feel of the early sf stories perfectly. I agree completely. There’s something so optimistic about Van Dongen’s covers – his futures are bright, clean, and filled with beautiful women, men in capes, and spaceships with cool, elegant lines. Plus, the man knew how to use color! > I eventually got of all the series in paperback because the covers were so much better than the book club editions. > Are you planning on continuing this series with Best Of’s from other publishers once you finish with the Del Reys? Not really. I might come back at a later date to do the Pocket BEST OF volumes, but right now I’m thinking of exploring some older anthologies and early Ace paperbacks. I was debating doing the Ballantine Adult Fantasy line for a while, but that’s a pretty huge undertaking! You’re right, that is a huge undertaking. If you aren’t going to, I might have a go at the Ballantine Adult Fantasy on my site. I was also planning on doing a reread of the Asimov’s Great SF series that DAW published in the 80s and 90s. Great stuff there. Both of these will probably not happen until November or later if I do them. Ah!! I’m jealous. I’d love to have the time to READ Asimov’s Great SF series — let alone review it. How many volumes are there? 18? 20? Man, what a great collection. I don’t have them all, and they’re VERY expensive these days. I find that in Lovecraft circles (i.e. websites, fanzines, podcasts, etc.) Campbell is ONLY known for “Who Goes There?” Since it was the inspiration for The Thing and many Lovecraft fans see very familiar ideas and themes from that movie with Lovecraft’s stories. There is a mass ignorance among Lovecraft fans on how influential Campbell was in the field of science fiction during the WWII pulp era. The editor that I think most Lovecraft aficionados are most familiar with is Farnsworth Wright. It would be interesting to see how many SF fans know who Wright is. One reason I appreciate posts like this is that I believe they help to cross-pollinate and make our favorite fields less ghettoized.